This painting by an Indian artist was probably made for the British market in India and shows the interior of Tipu Sultan's summer palace. In the background are soldiers in 'tiger-marked' uniforms, reflecting Tipu Sultan's lifelong obsession with the animal. It was his emblem of state, and the British came to know him as 'The Tiger of Mysore'. The V&A houses a mechanical organ ('Tippoo's Tiger') that once belonged to him. It is in the form of a European being mauled by a tiger. 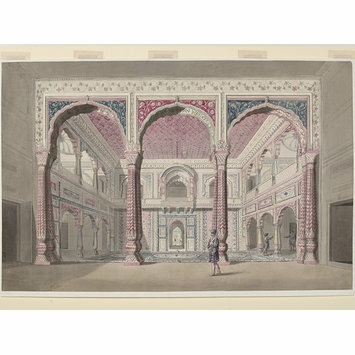 View of the Darya Daulat Bagh - a richly decorated interior room viewed through an arched entrance. Three soldiers in 'tiger marked' uniforms can be seen - one in front of pillars, two at right. 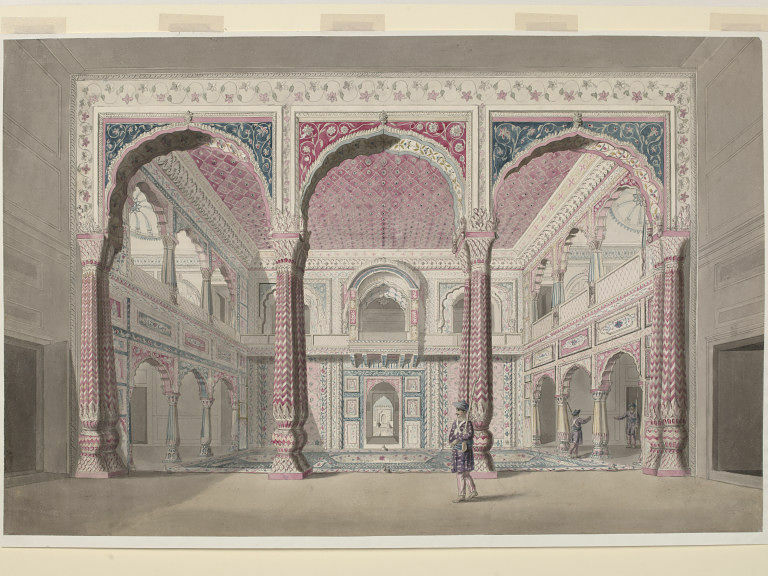 Folio from a volume of "Views in India", containing 49 watercolour paintings, bought on 4 March 1887 from Mr. T. Toon of 38 Leicester Square for £50. The 'tiger-marked' uniforms, reflecting Tipu Sultan's life long obsession with the animal. It was his emblem of state, and he became known to the British as 'The Tiger of Mysore'. Buildings from various parts of India were included by Calcutta and Murshidabad artists in their sets depicting famous monuments. A similar painting of the same building is in the Royal Collection at Windsor Castle.